Few reigns have had more significance than that of Charlemagne. 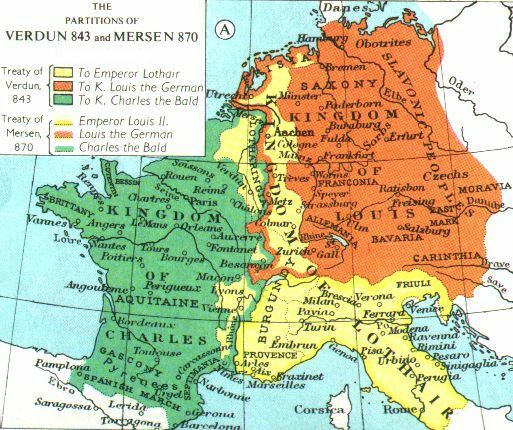 When he assumed the throne of the Franks in 768 the “dark ages” had run of things on the European continent. Little settled political order existed, and the world of most villagers narrowed to their immediate sphere. Travel and mobility came with far too much unpredictability. Upon his death in 814, Europe had begun its transformation into what we might recognize as civilization. Not only had a discernible political order emerged, but the “Carolingian Renaissance” started to bring back the rudiments of culture and learning. The geography of Europe changed, as these “before” (ca. AD 700) and “after” (AD 814) maps of Europe indicate. . .
Building with stone requires a higher degree of specialized skill than either mud-brick or wood, showing advancement. Stone is more time-consuming, but also more durable. No one would build with stone who thought about moving anytime soon. The use of stone in the 9th century AD shows more than mere political stability, it shows a return of confidence, what historian Kenneth Clark argues is one of the unseen foundations of any civilization. Clark may or may not have been a Christian, but he recognized the key truth that civilization rests ultimately on psychological/spiritual factors, rather than mere “physical” factors like good laws and good economies. He is one of the few historians I’ve come across who gives the lion’s share of credit to the Church for recovering civilization after Rome’s fall. Last week the students go their first introduction to Clark, one of my favorite historians. This site’s title is in fact an homage to Clark. I realize that students may not go ga-ga over a mildly stuffy British lord with bad teeth, but Clark has much to teach us. He possessed a discerning eye and a careful mind, one that could read a great deal from the creative works left by the past. Here is the first few minutes of the first episode, though I recommend just about everything he did. . .
Charlemagne’s times raised difficult questions for the Church then, and by proxy for the Church today. The Church has an interest in good government and good order for society. All in all, the Church would prefer a government friendly to its interests. But all government rests in the end, on owning the monopoly on violence in a particular geography. This is inevitable in any age. The Church then, and the Church today, has hard choices about what to support and what to protest. The state does not bear the sword for nothing, as St. Paul stated in Romans. But the state has its own interests apart from the Kingdom that the Church should critique. In this intricate dance, it’s easy to miss a few steps. However much we might deplore Charlemagne’s violence we might be forced to see it as necessary for the “reboot” of civilization to have one strong-man impose his singular vision. While this vision may have been less than perfect, it stood superior to anything before it. Or, we can say that the breakup of his kingdom after his death comes as a byproduct of the violence of his reign. Charlemagne taught his successors that violence was the pathway to getting what you wanted. Civilization took a few backward steps after Charlemagne, but the seeds planted during his reign bore fruit later. This is why I personally can’t fully accept argument #2 above. Charlemagne had an eye to something other than just violence. 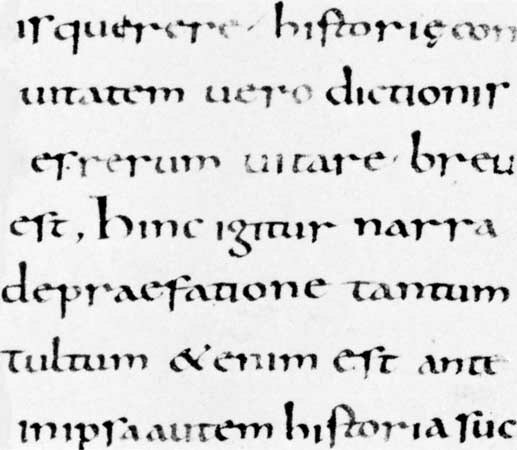 Take for example the development of the elegant “Carolingian” script during his time, which shows a different side of the man. 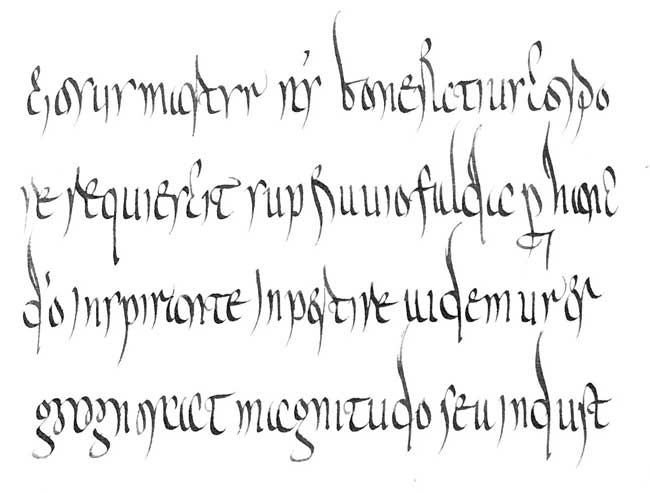 First, the script that preceded it, the “Merovingian” style . . .
And now the Carolingian . . .
One can perhaps see Charlemagne’s practical, decisive, hand in the handwriting that bears his namesake. I think it an improvement over the Merovingian — it’s more accessible to the common man. But Carolingian script is not strictly a “military” in nature, it shows a softer side of Charlemagne — it has a decided elegance about it. While handwriting styles shouldn’t always be taken as decisive evidence, I think it telling in this instance. The undercurrent of some semblance of Christian civilization had taken root, though the prevailing winds might blow in various directions. This is one Belloc’s most famous works, and should be read by students of Medieval history, though it is far too polemical to serve as ‘the’ text for the period. To understand the book we should understand a bit about Belloc himself. Born of an English mother and a French father, Belloc moved easily in both societies but perhaps felt at home in neither. He served in the French army, but got his education in England. 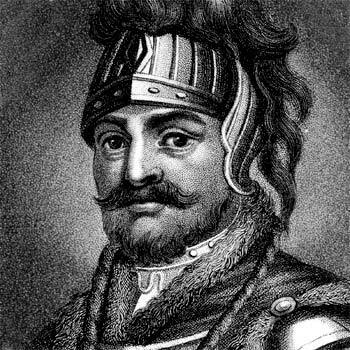 His strong and unwavering Catholicism definitely made him enemies, especially in England. He may have felt some alienation, but he loved good fights, and had no trouble finding them. One must also glimpse the context of when he wrote this book for it to make sense. I have not read a lot of his histories but he seemed to me have an eternal hatred against 1) The prevailing Whig interpretation of history, which saw history as one long climb out of the darkness in the wake of Rome towards the glorious & inevitable light of Victorian English society, and 2) The then-current Darwin influenced racial interpretations of European history, which saw all things good in Europe, from its “energy,” to its representative governments coming from the all-holy Nordic-Teutonic racial stock. When he published this book W.W. I had done much to undermine the first premise, but tragically the second was still gaining steam (Belloc gets high marks for his early and strident criticism of Nazi ideology even before they came into power). 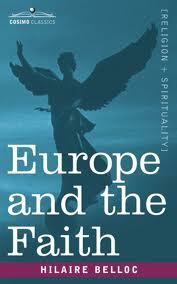 The book makes several different arguments, all around a central theme, that of the essential unity of Europe. He first mentions that one cannot understand European history without understanding the importance of Christian belief and the theology and history of the Church. He takes as a type the example of the encounter between Henry II and St. Thomas Beckett. To one outside this understanding Beckett’s attempt to try and stop Henry II from having legal jurisdiction over priests seems obstructionist and archaic at best. Those inside see that Beckett may not have chosen the best issue to plant his flag, but he fought ultimately for the freedom and independence of the Church from the state. Without a free Church, no people can be free in a spiritual or political sense. If you miss this, you cannot make heads or tails of Beckett or Henry II. Europe’s history begins, not with Rome’s fall, but from the Roman conquest of Gaul. Nearly every historian will claim that Europe grew from seeds planted by Rome. Belloc goes much further and argues for a great deal of continuity between the late Empire and the early Middle Ages. And this is no mere difference of degree, but of overall perspective and purpose. He argues that the pseudo-racial theory of hardy German barbarians sweeping down from the north to end Rome has no basis in fact whatsoever. In denying a cataclysmic end to Rome from without, we can find more Roman, and not barbarian influence, in the society that succeeded Rome, and thus more continuity in the European experience. True, Rome incorporated barbarians into their army, and towards the end accelerated their progressivism and made many with barbarian ancestry high ranking officials and generals. Alaric of the famous 410 sack of Rome was one such man. He did not come to destroy Rome so much as claim his rightful place in it. The Battle of Adrianople in 378 stands as another such case. Many different types of Alaric’s throughout the waning phase of Rome fought each other, but for supremacy to rule what they held dear. None of them dreamt of destroying the empire’s unity, otherwise what would they rule over? Radagaisus’ invasion, contemporary with Alaric’s turn on Rome, helps Belloc’s point as well. For here we have a large truly barbarian force decisively beaten by the Roman army at a time when Romans were supposed to be “soft” and “decadent.” Rome did not fall due to barbarian invasions. This early section is the clearest and perhaps strongest of the book, but then I think he goes too far. Perhaps carried away by the fight and the truths he latches onto, he buys into the idea that we cannot really speak of a decisive “fall” of Rome at all. Instead we should envision and steady, gradual transition from one way of life to another, like easing into a hot-tub. His theory couldn’t have credence if it had no truth to it, and Belloc cites some linguistic and administrative evidence to back it up. But to my mind he goes too far, for a great deal of different evidence shows a large drop off in other kinds of measures of health and well-being, like travel, trade, navigation, writing, etc. We need not conclude that if Rome did not fall to barbarians, that it had no fall at all. Belloc then moves on to discuss certain key aspects of the medieval church, specifically their fight against central authority. They sought spiritual unity, not political unity, for no man can serve two masters. He also points out that the Christianity developed in such a way to become to very essence of Europe. We might speak of Stoicism, but not Christism. Christianity for medievals formed not “a way of life,” but the essence of life, with the Church’s life inseparable from that of any individual. Belloc never lived to see Vatican II, and that may have been a blessing. He was an old-school absolute Catholic in every respect, so he had no love for the Reformation, which he holds responsible for destroying the 1500 year unity of the continent. Belloc admits that the 15th century had many problems, and many from different quarters talked of the need for reform. 2. But he believes that the Reformation had nothing particularly positive to offer. Protestantism had an essentially negative and narrowing character, as each sect picked its pet doctrines and blew them out of their natural proportion. 3. The Reformation would have petered out had it not been for England. 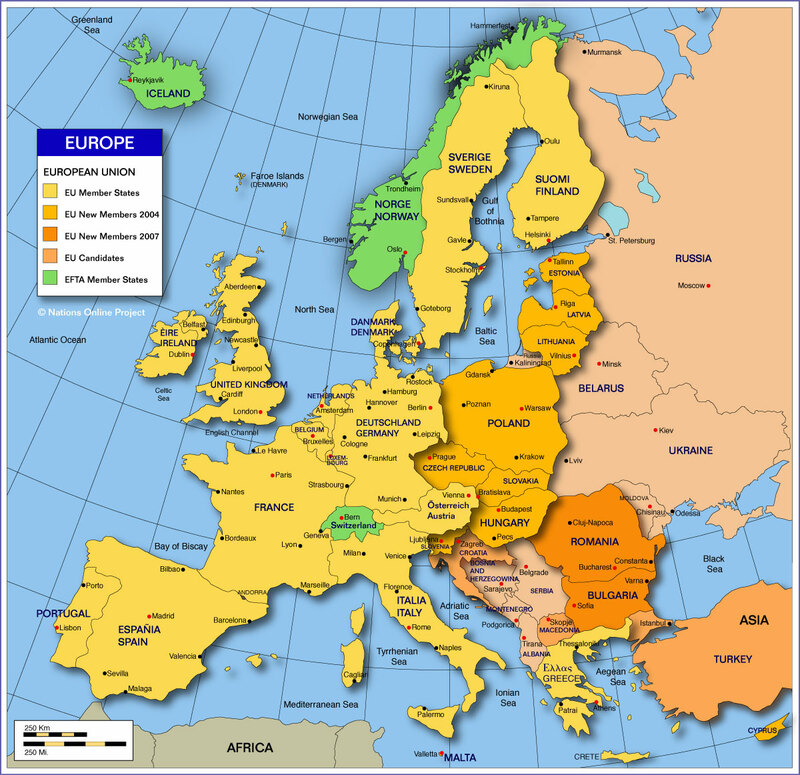 Before England, nearly everywhere the Reformation took hold stool outside the old Roman empire (Germany, Scandinavia, Switzerland), and thus outside the essential Roman unity of Europe, which the Reformation could not challenge. England’s defection not only meant that a powerful independent country could lend support to the cause, but most crucially, it broke the pattern of those within Rome’s ancient reach maintaining fidelity to unity, which gave legitimacy to the Reformation as a whole. Again, without this, he believes the Reformation would have gone the way of Arianism. The grand effect of the Reformation was isolation of the soul. This was its fruit. In the first place and underlying all, the isolation of the soul releases in society a furious new accession of force. The breakup of any stable system in physics, as in society, makes actual a prodigious reserve of potential energy. A flight first to reason (Englightenment), then to emotion (Romanticism), which having exhausted itself, left us only to pursue money and material gain (unbridled capitalism in the Industrial Revolution, which Belloc regards as a great evil). What can we make of Belloc’s arguments? Belloc has much to praise about the Renaissance, stating that the era continued much of the great things medievals started. But during the Renaissance many of the things Belloc deplores had their origin, like the banking empire of the Catholic (nominally?) D’Medici’s, or the exaltation of the political sphere in Machiavelli. Surely also the Church’s political maneuvering during the Middle Ages contributed to the problem of spiritual sterility in the 15th century. They played a tight game of fostering political disunity while trying to enhance overall spiritual unity. But this put them in the position of helping to create the monster that destroyed them, for in the end the political disunity they fostered became a tool for the Reformation to use to their advantage. It also made the Catholic Church part of the troubled system. Not standing outside it, they could offer no solution. He asserts that the Reformation had an almost exclusively negative character, but misses the positive aspects of some reformers, notably Luther. Clearly the Reformation also produced some great culture, Bach, Rembrandt, etc. To accept a Refomation = Bad, Renaissance = Good argument, one must believe in the basic continuity between the Medieval & Renaissance eras. But I think that more discontinuity presents itself, that the Renaissance began at least the aesthetic narrowing of Europe that the early Reformation built upon. To his great credit, Belloc admits the ultimate spiritual sterility of even the greatest Catholic humanist voices, like that of Erasmus. Whether justified or no, the Reformation filled a spiritual vacuum that the Catholic church could not fill in the state it was in. Finally, the Catholic church did its fair share of pushing Luther out of the fold. They helped create the Reformation. One could go farther and claim that the Reformation gave the Church a needed kick in the seat of their pants to get their own house in order. The Catholic revival of the mid-late 16th century (which produced such great witnesses as St. John of the Cross and St. Francis de Sales, among others) might not have happened without the Reformation. So all in all, I do not believe that the Reformation deserves the treatment Belloc gives it. But I agree with him that the Reformation exacerbated some key negative trends within Europe at the time, and that the lasting fruit of the Reformation is a mixed bag. It did not heal Europe’s wounds — in some cases it opened them further, and did contribute (without being the only contributor) to many of our modern problems. One can assert the necessity of the Reformation, but I would not want to make it into a golden age that “rescued” the Church and Europe. Also, when thinking about Europe Belloc leaves the East out of the discussion entirely, and so gives no credence at all to the possibility of a third path in Eastern Orthodoxy. Europe has recognized what Napoleon also saw, that every war in Europe had the quality of a civil war. So, kudos to them for seeing the problem. But — they look for a cure in all the wrong places. First, they have tried to impose unity in an administrative, “top-down” style where the people have little direct say in important policies. Such an approach is bound to fail. Second, they fail to recognize that from ca. 500 AD on, Europe had spiritual unity but never administrative and political unity. Thus, they try to give Europe what it never had at the expense of what held them together in the first place. Their focus almost exclusively on trade, currency, monetary policy, etc. shows their blindness to the true problems they face. Europe is the Faith, and the Faith is Europe. Very few would place Bach anywhere outside of one of the top musical masters in history. He has universal praise and admiration for his talent, innovation, and inspiration. Personally for me, Bach stands at the top, with Beethoven a very close second. I have yet to read a full-fledged Bach biography, but those that I have glanced at so far turned me off by phrases like, “A man of great musical genius and simple faith,” or “His outstanding musical ability contrasts with his unadorned faith,” or some other such sentiment. Certainly having a “simple” faith should be praised, if by the term one means something akin to purity of trust, or as Aquinas might have used the term, i.e. “unclouded.” But I doubt that the authors intend this meaning of the word. 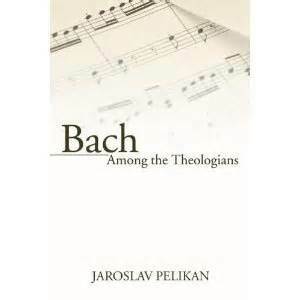 Instead I get the impression that they mean something like, “Bach poured his genius into his music while rubber-stamping his faith.” Jaroslav Peikan’s Bach Among the Theologians dispels these notions once and for all, and shows Bach to have thought deeply about theological concerns, which he expressed not in letters, memoirs, or treatises but in his music. Pelikan first sets the context of Bach’s music within the Reformation as a whole. Living on this side of the Reformation many may take certain things about worship for granted. Before the Reformation, churches had musicians, “striving for perfection in the true style of this music, a a performance far removed from subjective expression and concert effectiveness” that often centered around Gregorian chant. The dissolution of this heritage opened up new possibilities for good and evil. Granted, Pelikan admits that Protestant worship music might tend to take on a “performance” character, and hence the horrifying “worship leader” stereotype, which must be one of the worst inheritances of the Reformation. On the other hand, we had the introduction of congregational singing and participation in the service. And while I do think that the Reformation should have kept the baby and at least some of the bathwater from their medieval past, the changes allowed Bach to develop music along a “concert-like” character and forge a whole new style of church music. “The liturgical year is the context in which the Church commemorates, day by day, all history.” Pelikan reminds us that the Church calendar doesn’t merely provide a convenience, it expresses a theology of time. * The major festivals of the church with one exception (Trinity Sunday, the latest addition to the calendar) celebrate not doctrines, but events. The cycle of four seasons integrate our experience with that of creation as a whole. This formed the subtle, sometimes unseen backdrop to Bach’s work. Since much of Bach’s work, then, got commissioned to commemorate events, the possibility of more emotional and experiential content in his music. Bach never wavered from his staunchly confessional Lutheran perspective. He appears not to have thought much about ever joining a different church. Some might use this to support the “simple faith” thesis of Bach, but Pelikan shows that Bach interacted with many different prevailing ideas of his time and yet was captured by none of them. Bach admired Frederick the Great and Enlightenment rationalism, with its emphasis on balance and symmetry, and muted sensibility. We see this influence in his Well Tempered Clavier, and The Art of the Fugue to great effect (Pelikan also points out the geometrical symmetry of some of his cantatas). This is the kind of Bach music that gives you a contented sense of completion. But unlike other somewhat contemporary artists (perhaps like Vivaldi, for example), Bach’s range extended far beyond “rationalist” confines. To the dismay of some of his Lutheran patrons, Bach admired some aspects of the emerging Pietist movement, which stressed the importance of subjective religious experience. Pietists occupied almost the opposite point on the spectrum from the rationalists, yet Bach felt comfortable here too. He could see that just as reason has a place in God’s economy, so too does subjective emotional experience. Bach applied his understanding in his St. Matthew’s Passion, where he emphasizes the suffering of Jesus the individual. In emphasizing such “subjective” emotions, Bach went against some of his staunchest Lutheran supporters (which undercuts whoever sees Bach as a mere tool of his patrons). But in St. John’s Passion Bach picks up on that gospel’s different perspective. In John’s narrative the resurrection receives far more attention, and the resurrection is not just Christ’s victory, but that of all mankind. So he makes St. John’s Passion more magisterial and universal in scope. In these different emphases Bach paid heed to the differences in the texts themselves. Matthew’s gospel has the most Old Testament references so might be described as the gospel that gets the most context, hence, the most particularity. John wrote his gospel much later after the fall of Jerusalem, and so his account gives us more universal, grand themes. Again we see Bach not merely as a musician in a vacuum, but using music to express theology (as I suppose all music does in one way or another). And finally, the wilder, unhinged Bach of the B Minor Mass . . .
Pelikan reminds us that we will not see the modern view of the artist as the man freed from all limits in Bach no matter how hard we look, however. Yes, he innovated and tweaked sensibilities. Yes, he refused to let one particular theological perspective bind him But his “sacred” works (Pelikan recognizes that with Bach the line between his “sacred” and “secular” works is very thin indeed) all answered to the liturgy of the Church and its measurement of time. If the four seasons of the year give us different perspectives and priorities, so too the Church calendar gives time itself a context. In rooting us to all of time and mapping it out for us, the Church reminds us that God has something to say about all of our experience in His world. God’s limitations, then, are much broader, wider, and deeper than any freedoms we might imagine we grant ourselves. No matter how hard we may try, none of us can break free from the limitations of time itself. *This gives us a hint as to why controversies in the church surrounding say, when Easter should be celebrated seem arcane and irrelevant to us, but had much greater importance to them. The back cover of this book by James K. Thompson proclaims that, “there are few comparative studies available” of theories of decline,” whereas “growth” gets all the attention. This seems false to me. Hollywood can’t go more than a few weeks without making a movie about huge disasters and the end of all things. Americans, at least, seem to be continually questioning themselves and pondering our place in the cosmos. Historians too, going back to Thucydides at least, seem in general more drawn to decline than growth. And admittedly for me, the title Decline in History: The European Experience in itself got me to look at the book in the first place. It seems that I, like everyone else, have decline on the brain. Thompson sets out to first examine two basic approaches to decline taken in the 20th century, and then see via synthesis whether or not he can come up his own grand theory. In past centuries theories of decline had their roots in the actions of men, and here I don’t mean “mankind” generally but men as political leaders most particularly. Not much else got examined. In the early 20th century Spengler and Toynbee changed this standard approach and saw the actions of people in general against a back drop of a process of growth and decay that had either the dread inevitability of death about it (Spengler) or the great likelihood of human actions adding up to eventual failure (Toynbee). Enter into the arena the Fernand Braudel, a patient, meticulous genius who rebelled utterly from the standard way of viewing decline. He looked at everything but people and instead focused on climate, the soil, geographical positioning, and observed slight changes over time. * So, Portugal was doomed not so much by what it did as by the fact that their forests could never keep up with their shipbuilding, thus leading to an inevitable overextension in their soil. The Mediterranean itself never had high quality soil. So while (perhaps following Toynbee) this initially presented a great challenge and brought out an inspired response from those who lived there, no amount of human ingenuity could fundamentally change nature. The receding tide of Mediterranean dominance was written under the soles of their feet. Other 20th century historians followed Braudel armed with a Marxist approach that focused on social class, such as Michael Mann. Success in any civilization raises the standard of living for the middle class. This middle class then aspires to join the aristocracy, or at least emulate their habits. This results in exploitation of the lower classes and with that, an attendant social and political decay. Thus for Braudel and Mann, success, exploitation, and decline all go together, whether in the soil or in the mass of humanity. Thompson attempts to glean from these approaches (with a few others thrown in as well) and come up with his own approach. I liked his broad spectrum approach, and some of his examples show give great illumination into what happens with decline across different civilizations. Historically rises in power, and shifts in power, tend to have two main characteristics. One is proximity to the coast, for coastal regions will lead to fruitful contact with other civilizations. The second factor in significant and sustained growth lies in the coastal region’s proximity to another great power of different aspect, allowing for progress arising out of a dynamic synergy. So Greece’s proximity to Egypt presaged a shift from the Fertile Crescent to the Mediterranean. Venice’s location on Italy’s northeastern coast gave them beneficial interaction with Byzantium. So Venice’s decline in power might have less to do with Venice and more to do with the Moslem conquest of Byzantium by 1453. Now the possibility of fruitful interaction ended, and the “center of gravity” shifted away from the Mediterranean towards the Atlantic. This gave Portugal the early advantage in the next growth cycle. But for Thompson growth and decline involve more than geographic position. Portugal’s quick rise had something to do with geography, but also to the dominance of the aristocracy with a high-born and heroic ideal. As De Tocqueville states, aristocratic societies will eagerly jump into the fray when competition, honor, and glory beckon. They are bred for that sort of thing, and perhaps this explains (along with their geography) why Thompson then suggests that perhaps Portugal held onto their empire for longer than we might expect due to the tenacity of the peasant class seeping into the Portuguese ethos. But it was this lack of a strong merchant middle-class that meant that they could not really implement their enormous gains and diffuse them into the whole of society. Imagine one getting first to Thanksgiving dinner, gorging oneself, but lacking proper digestion. Everything would sit in the belly with none of the nourishment passed to the body, immobilizing the unfortunate eager diner. A transitional state, between Antiquity and the medieval world, one too whose quixotic obsession with preserving the imperial ideal [agreeing with Toynbee’s spiritual analysis of Byzantium] caused it to clash continuously with new economic, social, and political developments, thus, not altogether surprisingly, can be seen to have experienced the type of decline associated with both types of civilization. Based on Thompson’s brief summary, I think I would have more sympathy with Diehl than he. But Diehl himself suggests an interesting point of confluence between the political and sociological perspectives when he argues that at a certain point, Byzantium issues lay beyond the help of any one ruler. Eventually concrete sets in that requires a catastrophe to loosen. I like this approach of synthesizing different approaches, but few historians have the necessary nimbleness of mind, personality, and the patience of research to achieve this. Perhaps that leaves us layman needing to seek out different writers with different strengths and different points of view. *I have tried (feebly) to read Braudel and failed on multiple occasions. How he gathered his research, how he had the patience to do so, is beyond me. I do think, however, that while his methods have much to commend them, writing history without focusing on people seems too clever by half.